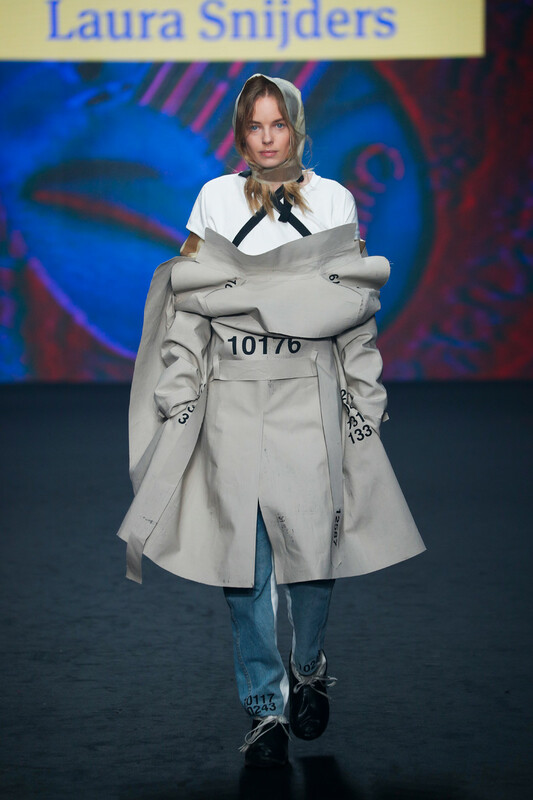 Supermarket Lidl made it’s way onto the Amsterdam Fashion Week schedule this week. A supermarket showing during fashion week? You might be surprised. But for anyone who missed Lidl’s expansion into trendy fashion; Lidl has been working with topmodel Heidi Klum for over a year now. Her designs for the supermarket chain sell like hot cakes and so it is time for a new collection. On Sunday she presented her brand new line up of looks named #LETSSHAKEITUP. And boy did they shake things up. Or at least they gave the idea of a runway show a typical new twist. In small groups of about six models arrived onto the runway all wearing similar looks. Some of them carried the supermarket’s products in their hands, signature items, like washing gel. At the same time Lidl’s bestsellers, pretzels, coffee, fruit, tea and what not were projected onto the backdrop. 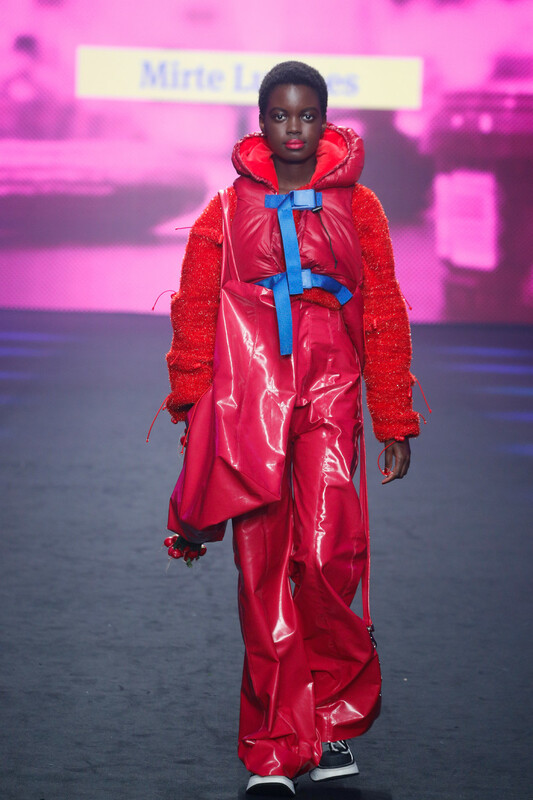 Five young Dutch designers from different fashion academies in the Netherlands participated in the show. Those students were Mirte Luijmes – HKU Hogeschool voor de kunsten Utrecht, Heidi Dai – WDKA Willem de Kooning Rotterdam, Lieselot Elzinga -Gerrit Rietveld Academie Amsterdam, Amber Willemztijn – Artez University of Artz Arnhem and Laura Snijders – KABK Koninklijke Academie voor beeldende kunsten Den Haag. Each student presented one of her designs in between the Lidl looks. Fashion wise the Lidl collection consisted of classics, basics, all greeners, no brainers, wardrobe essentials, must haves; you get the idea. “I love classic pieces like trenchcoats, turtle necks and cosy pants. In my new collection these are all made in fresh red shades which turns these basics into special eyecatchers”, Heidi stated. And so she sent out colorful vests, trench coats, trousers, handbags, carves and loafers with a price range from €2,99 to €29,99. Simple, classic, qualitative and affordable. A collection that might just sell out faster than Lidl’s home baked hot cakes..